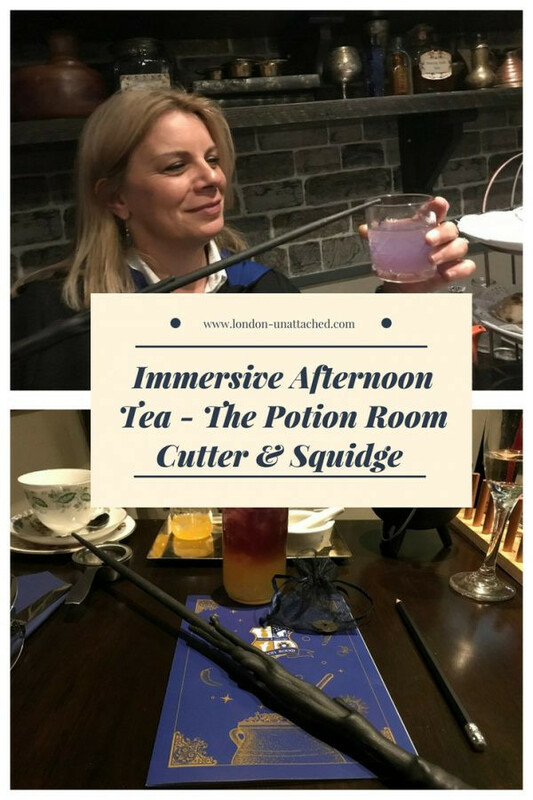 My son and I rushed away from work on Thursday afternoon for a new “immersive” afternoon tea experience at The Potion Room, Cutter & Squidge in Soho. Unlike our jobs that day, this was certainly not mundane! Arriving at Brewer Street, we were both not sure what exactly to expect. 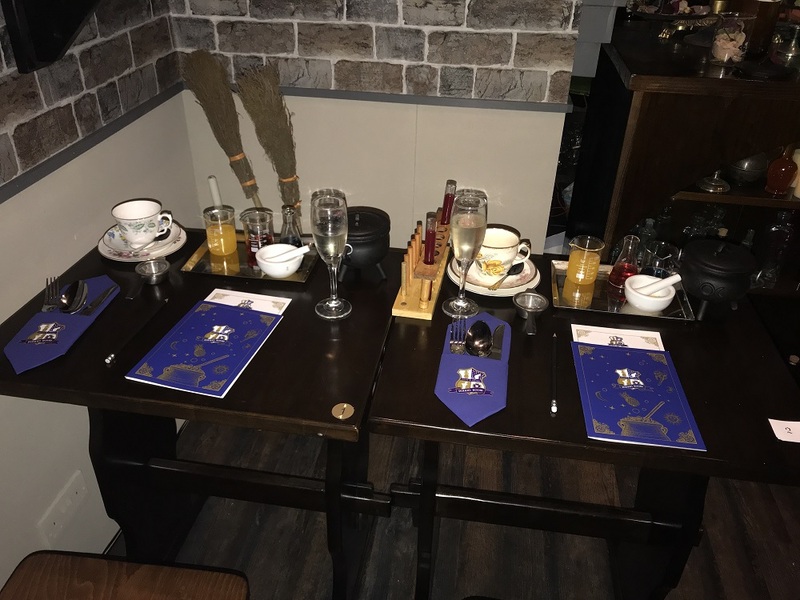 After a welcome drink in Cutter & Squidge’s bright and airy café above ground we were whisked downstairs into the dungeons and toward the potion master’s classroom. 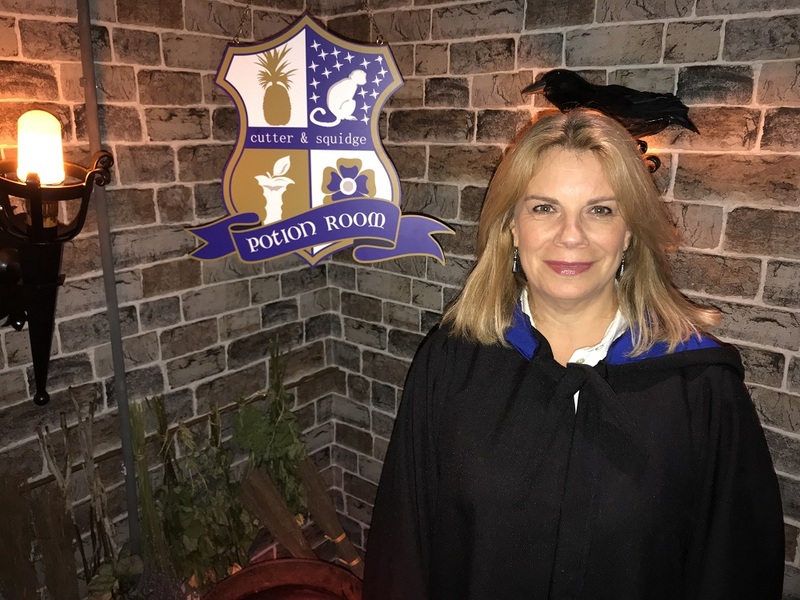 Before we could enter, we, of course, had to look the part and were swiftly supplied with gowns to wear, hiding our work clothes and helping us get into character as young witches and wizards eager for their first foray into the magical world of potion making. 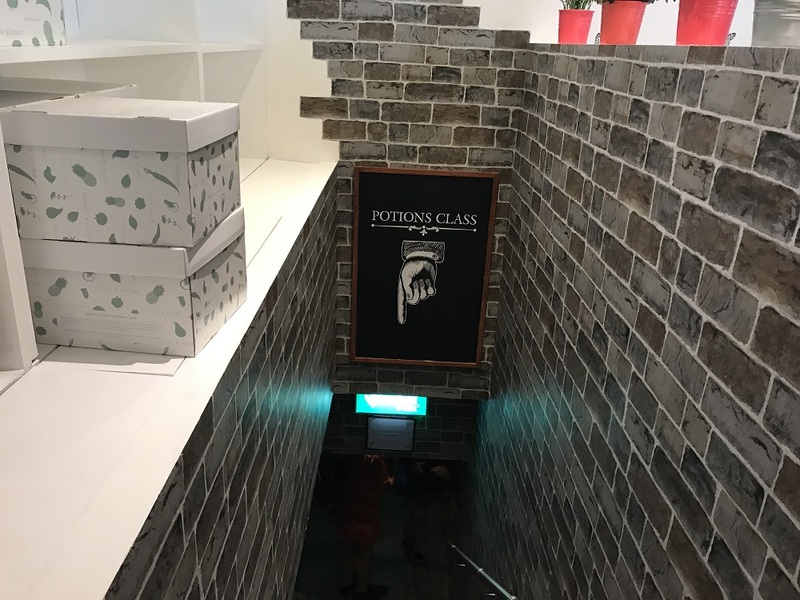 We entered the classroom that was to be our teaching space for the following hour and a half (the full experience normally lasts for two hours) to be greeted by a slightly grumpy potions master, quite in character, ordering us to move quickly and quietly to our desks. 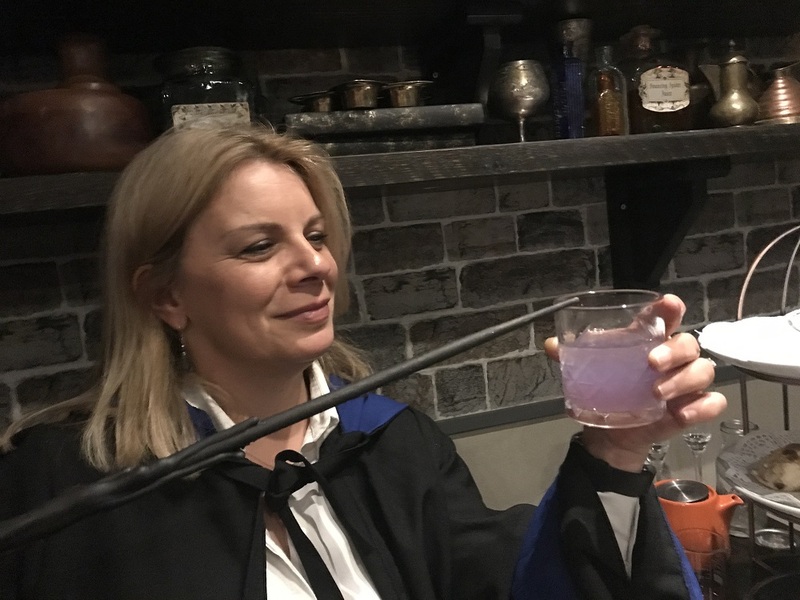 In front of us on our desks were an array of magical ingredients, a cauldron, pestle and mortar except for one crucial missing ingredient – a wand. 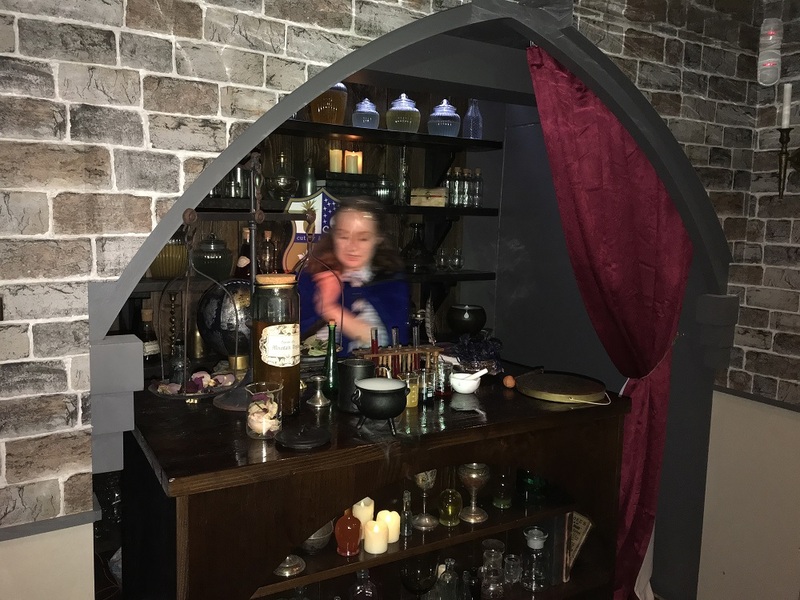 After an introduction to The Potion Room, the potions master explained the basics of potion making and a potted history of the magic in her room. And then we were informed of the classroom rules – dont touch the precious objects on the shelves, photos allowed, just not of the extra special surprise, please! Our first task set by our enigmatic teacher was the creation of a mysterious potion. This was named Galaxy Juice, made by combining the finest fruits, flowers and a drop of a very secret ingredient, the tears of a unicorn distilled into tea form. The mixture was an amazing swirl of yellows, purples and reds and was perfect to quench our thirst on what was a warm spring day in London. We were nice and comfortable in the cool dungeons. We each got a one-on-one session to choose our wands. After pondering whether the wizard chooses the wand or vice versa for a few moments we were fully equipped for our lesson. Using both the cauldron and the pestle and mortar assembled on our desks we summoned up a popping mixture of lemon sherbet, biscuit and meringue, both sharp and sweet that fizzed both before our eyes and in the mouth and was delightful in taste. Speaking of thirst, no afternoon tea would be complete without the hot beverage that is ubiquitous in both the human and the magical world and so we got to choose from a vast array of teas, from more traditional brews like fresh mint, green or earl grey through to the aforementioned Unicorn Tear tea. In addition to the galaxy juice and the welcome glass of prosecco, the free-flowing tea meant we needed some food to go with it all. Our wishes were answered in the form of our second magical creation – the Crackling Cauldron. After the sweet interlude, it was time to sample the main attraction – a three tiered spectacle of magic infused and inspired treats that formed the core of the afternoon tea. A classic selection of sandwiches, a warm filled pie, mini Yorkshire puddings, a Knickerbocker bite and a Cauldron Biskie (a sweet chocolate and butterscotch treat that was probably the most magical of the food) were accompanied by just baked Rock Cakes. This was certainly more than enough food for one and definitely did not leave us feeling short changed. I didn’t feel short changed either. 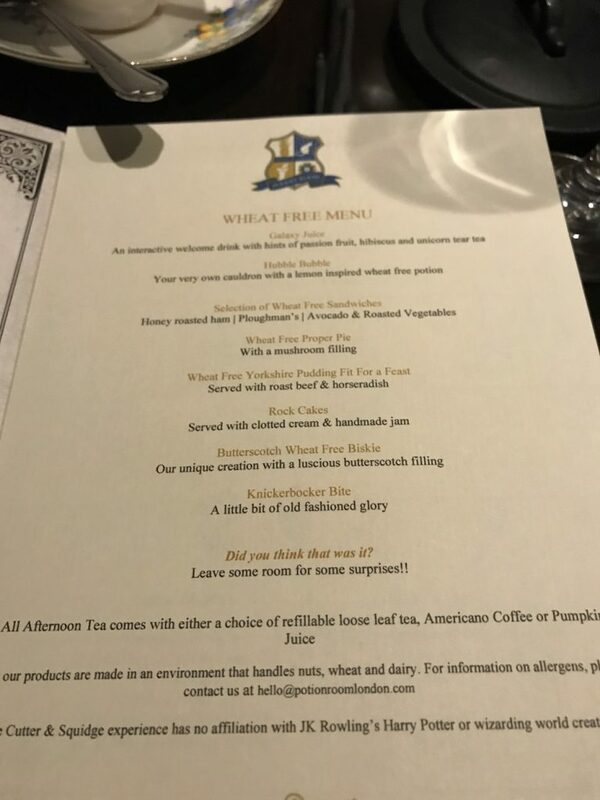 Cutter & Squidge have gone to great lengths to make their experience inclusive to those with dietary needs and my gluten free menu did not lack any of the sparkle of the normal menu. Wheat-free versions of all the normal parts of the tea were on offer, with slightly different fillings but no less texture or flavour. My pie was served in a teacup with just a pastry top. 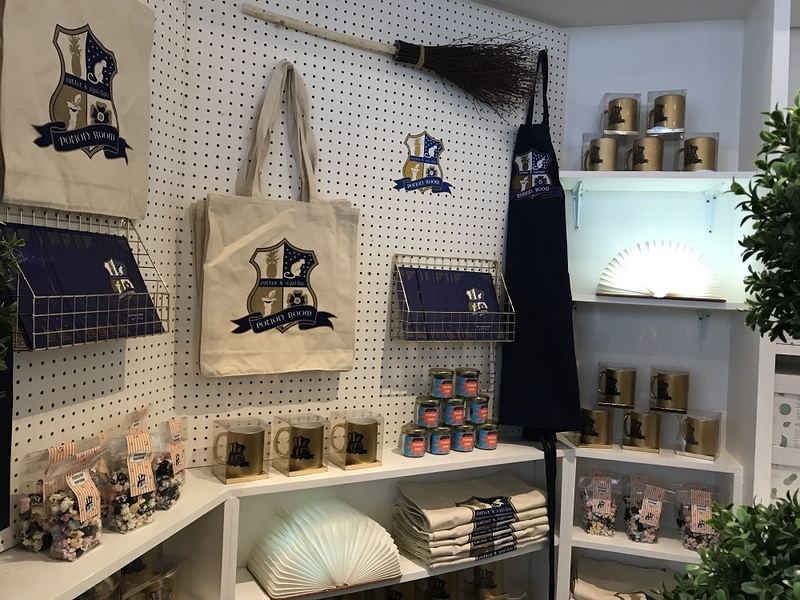 They also offer vegetarian, vegan, dairy free and a children’s menu, all offering inventive twists on the original treats to make them suitable for a different diet. 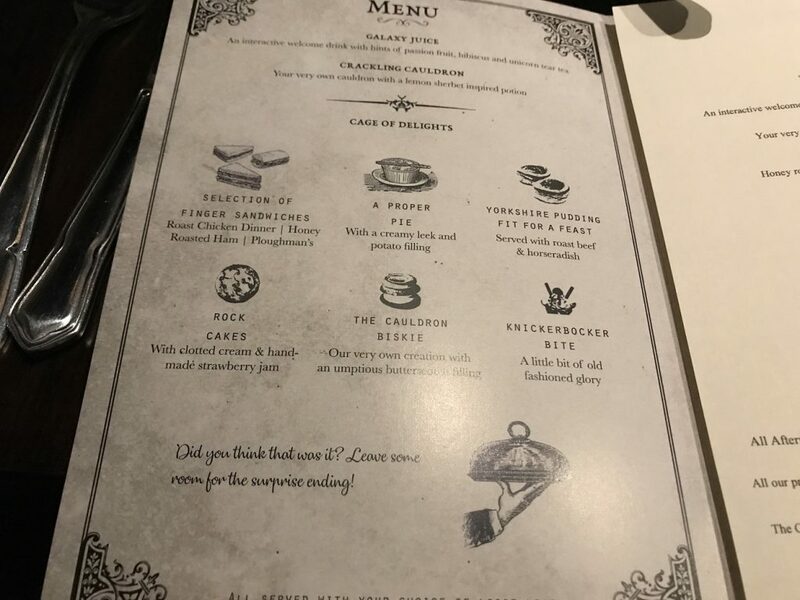 For the adults in the room, we were able to choose a cocktail each. We went for a Goblin’s Punch and a Unicorn Sours – vodka with a twist of apple and lemon respectively. We were feeling quite full after indulging in the fine spread of food and were quite happy that, (apart from the special surprise at the end “not to be mentioned”) it was time to take what we had learned into the outside world. By the end of the lesson, the Potion Master had become quite agreeable, clearly happy with the progress we had made in just an hour and half of her tuition with her array of equipment. 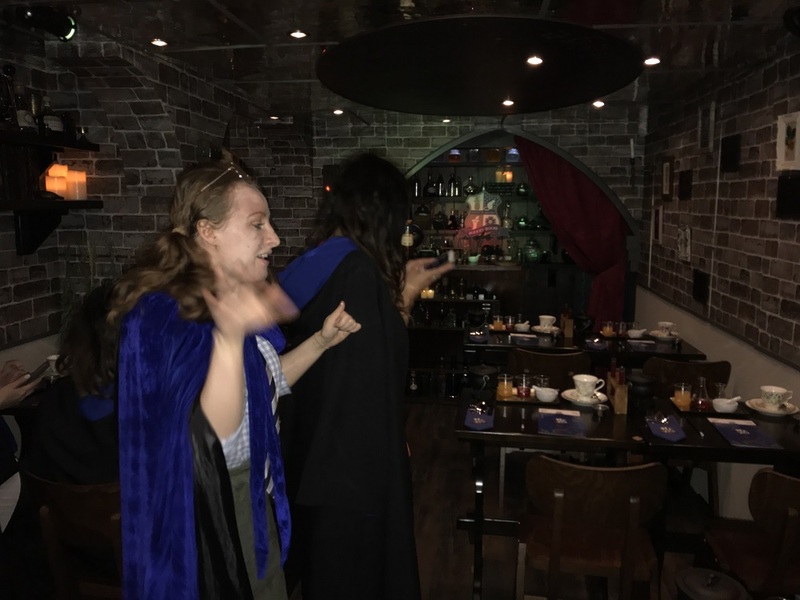 After removing our gowns we emerged from the dungeons, with our leftovers in a box and blinking slightly in the bright light of the café. On the way we passed by the high-quality range of merchandise available to purchase as gifts or to remember the fun experience. 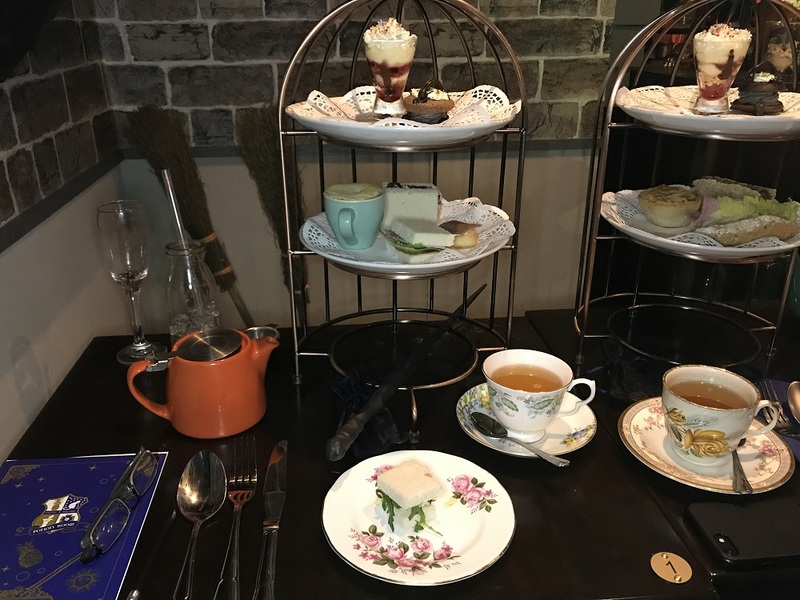 We departed on to the slightly less magical Central London street but taking with us memories of a fun afternoon tea experience that caters to wide range of ages and personalities. 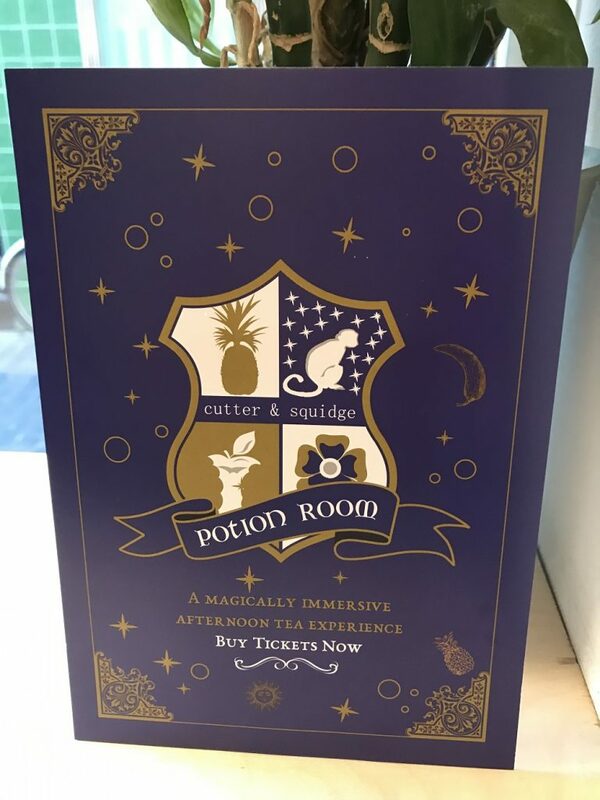 If you are willing to immerse yourself in the experience of wizarding alchemy then you will have a quite magical time at the Potion Room by Cutter & Squidge. 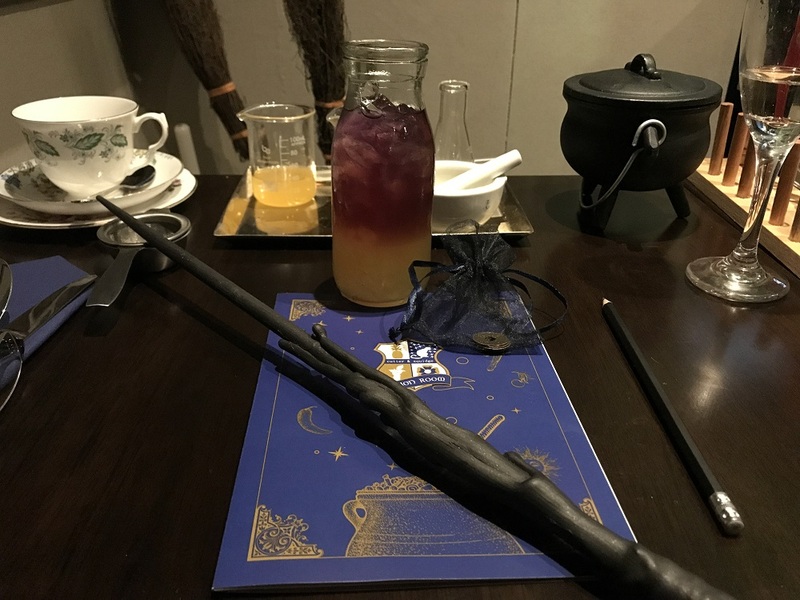 And definitely something to try if you are in London for a Harry Potter Vacation! We were guests of Cutter & Squidge.